In the art of designing a garden, there is a certain alluring captivation gained by partially concealing and carefully screening some parts of the garden from immediate view. Predictably, the imagination is tempted to anticipate the presence of unseen delights as curiosity is quickened in expectation of some extra enchantment. Well-placed arbors, pergolas and trellises are some of the most effective means to provide this type of sanctuary - affording seclusion, quiet and comfort. These garden structures spell the difference between a well-designed garden and the well-intended garden. Several forms of trellises are shown in the accompanying garden photographs. A trellis is a garden decoration consisting of vines or creepers, trailing over walls or vaults, sometimes with an arch. A trellis is a system of ornament, either flat or convex and consists of bandelettes intertwined. With the flexible laths, deep archways can be formed in the trellis to shape a roof-like frame, especially popular in rose gardens. 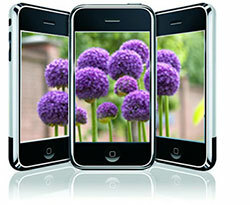 Almost any style trellis can effectively screen unpleasant scenery. Does your garden need that added touch of charm that a well-designed trellis can provide? Trellises can form attractive visual breaks in large expanses of uninteresting foliage. Tall hedges of holly or yew can provide substantial divisions and separations in any backyard design, but years must pass before such hedges can be effective. This is where the garden trellis will establish an effective substitute; against it the hedge can be planted, protected and trained over time. 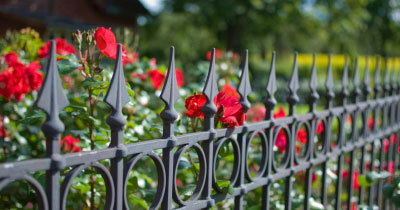 Trellis work is the most economical and effective means of securing interest in a garden. Trellis work can provide both shade and shelter. Its post-and-rail and lattice-work design can be changed or transformed into multiple shapes until the desired effect is obtained. With the flexible laths, deep archways can be formed in the trellis to shape a roof-like frame, especially popular in rose gardens. In designing a trellis, remember to support climber plants and note that the shape of the spats, balusters, or laths should be such as to encourage the branches to obtain a secure hold. The best form is the crossed lattice trellis, and the worst, plain upright bars without cross bars for the support of the climbers. Almost any weather-resistant wood is adequate for making trellises when protected with paint, but the most rot-resistant woods for outdoors are Western red cedar, redwood and cypress. For added protection on parts that are buried, wood should be treated with a preservative, one that will not bleed through paint. 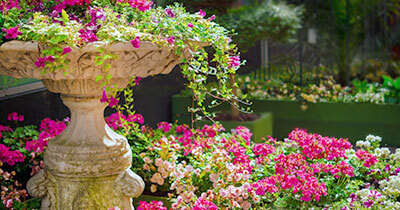 You may prefer a trellis of unusual design or a custom tailored look for a favorite location in your garden. Espalier trellises are simple ornamental trellises covered with a small-leaf ornamental plant that has been trained to grow in a flat plane against a trellis. These trellises are frequently used to shape dwarf trees and roses. Fern trellis have eight up-rights with a flowerpot cut-out. For older homes, the Gothic trellis features three small crosses and is best for a wall decoration with a delicate climber. It is most attractive when affixed close to the wall and painted in a contrasting color. Stickpin trellises are effortlessly driven into the ground and removed easily for winter storage. 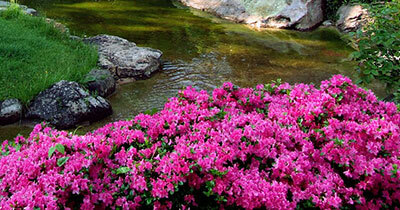 They are strikingly different from conventional trellises and are covered only sparsely with delicate foliage. Almost any style trellis can effectively screen unpleasant scenery such as a backyard storage area, garden shed, or air conditioning units that are untidy. 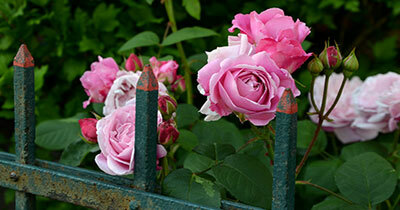 Moreover, a well-placed trellis can successfully hide a vacant weed-filled area behind a fence. A high trellis that extends above the fence can conceal an unsightly lot. On picket fences, the space between the pickets often is sufficient to permit the attachment of the trellis uprights to the fence rails. A vine trained to grow over the trellis will hide any unattractive view. On a wood trellis roses, clematis, jessamine and honeysuckle will climb eagerly.